Test Range 2.5 mm to 5 meter (in steel). In Hot Key mode it has 13 preset values. Fine mode adjustable in step of 1mm. Velocity 1000 m/s to 9999 m/s. In Hot Key mode it has 7 preset values. Fine mode adjustable in step of 1 m/s. Delay Up to 3 meter adjustable in 0.5mm or 5mm step. Rejection 0 to 100% FSH with LED indicator. Rectification Fullwave rectified with filtering. Linearity deviation Vertical: 3%,Horizontal: 0.5%. Connectors LEMO Size 00 (2 nos). Monitor Dual gate adjustable in 1% of Screen width with Positive/Negative logic, Gate Expand modes. Gate Expand Expands Range to width of the gate. A-Scan memory 500 Trace Patterns can be stored, recalled or transferred to PC via USB port. A-Scan trace pattern can be directly stored on SD card or on External USB disk. 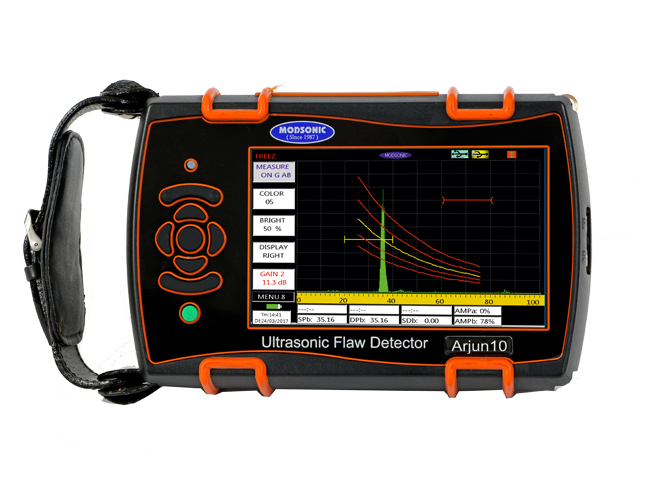 Software ArjnSoft Interface software for transferring A-Scan from Arjun10 to PC is supplied. USB and SD card External USB disk and Micro SD card (upto 8GB) ports provided for data storage. Reference A-Scan Reference A-Scan pattern of standard test object can saved and recalled in the background for easy comparisons during testing. DAC Dynamic DAC curve can be Digitally plotted(Smooth parabolic curve) on screen with selectable additional offset curves from 0 to 14 dB in 0.5 dB selectable steps. DAC curve can be set as flaw monitor gate. DAC curve can be plotted using minimum 2 to maximum 10 points. Power Lithium-Ion Battery pack 7.4VDC,5AH, gives 10 hours continuous operation from fully charged battery and External charger is provided to charge the battery with out engaging the main unit. Weight 800 gms with Battery.